Mark your calendars! On April 27th we will be hosting an all day gaming day, a Board Game Relay with Chits & Bits, and a Used Game Sale. Be sure to come play some games, share some love, and win some stuff! 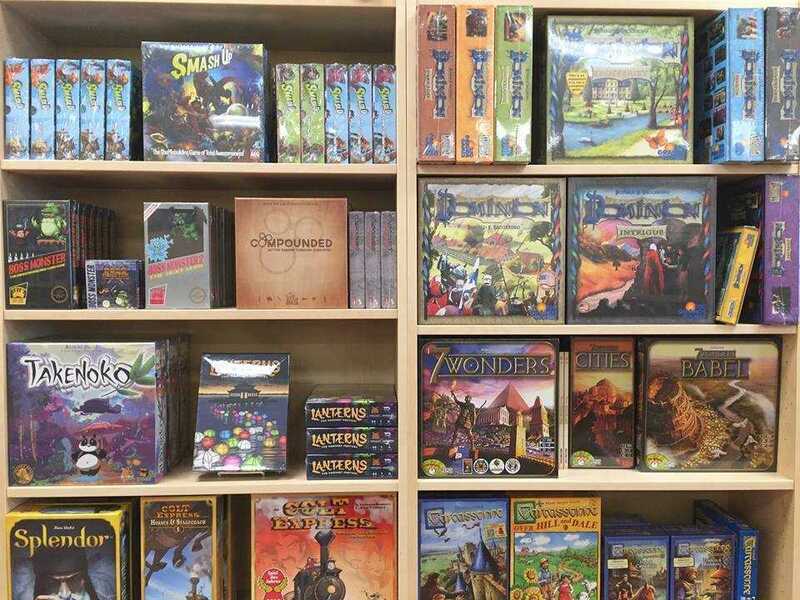 The Used Board Game Sale will take place all weekend long, from 9:00 AM to 9:00 PM on Saturday, then again from 10:00 AM to 6:00 PM on Sunday. Anyone who has something in their personal libraries that they’re looking to trade out for something new will be able to bring it to the shop, set the price they’d like to sell it for, then browse all of the games that others have brought in and find something new. Any game that you bring in that is sold will earn you store credit equal to the price you set for it. Want to sell a copy of Catan for $10.00? If someone buys it, you’ll get $10.00 in Diversions store credit. Store credit will be issued by Tuesday, April 30th in a lump sum. If you sell $50.00 worth of games over the course of the weekend, you’ll get a single gift card worth $50.00. There is no limit to the number of games any one person can put up for sale. Any titles that did not sell over the weekend will be set aside and should be picked up by Friday, May 3rd. Hard copies of the form will also be available in the shop for those that need them. This form has all of the information that we will need from people looking to sell some games. On this sheet you’ll need to include your name, some contact information, the games that you’ll bring in to sell and how much you’d like to charge for them, and a signature line stating that all of the pieces for each game that you’re bringing are all accounted for. After you’ve filled out the sheet, bring it into the store with all of the games that you’re selling so that we can organize them and prep them for the sale. We will start accepting used games on Friday, April 12th, and the cutoff for bringing in games is Monday, April 22nd. We will not be accepting games prior to, or after the aforementioned dates. A couple of days before the event, we shall post a list of all of the games available for sale on our social media so that all you shoppers can prep accordingly. We do get a long line of guests waiting at the door in the morning, so if you’re looking for that specific game, you might want to be here early! We will not be reserving any used games, and coupons are not eligible to be used on these items.